STEINHOFF General Johannes, Knight's Cross with Oak Leaves and Swords. He flew over 930 combat missions with 176 confirmed victories. His first victory came in 1939 with JG 26. He went on to serve with JO 52 during the Battle of Britain, was then transferred to the Eastern Front and also served in North Africa and Sicily. He finally joined Galland's JV 44, flying the ME262 in which he scored 6 victories before being very seriously burned in a crash. 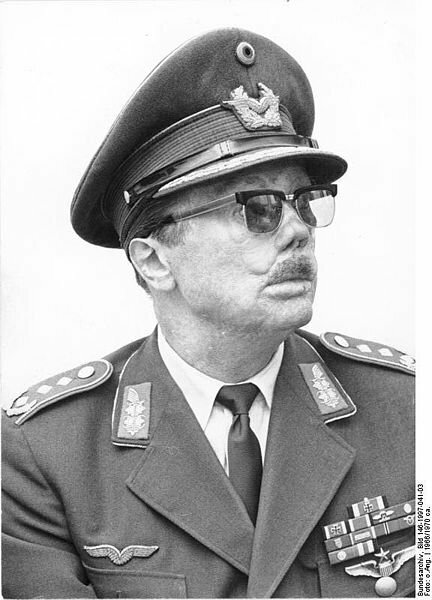 After the war, he went on to become Chief of Staff of the German Air Force and later Chairman of NATO's Military Committee.